Say bye-bye to all the errors, lengthy syncing, data loss, space woes, app crashes, and other iTunes sync errors with MacX Media Trans. It is the best alternative to iTunes that assists in syncing music, videos, and photos between iPhone and Mac without any errors. It also offers the highest level of security to your data with the end-to-end encryption. It uses high-grade encryption technology such as AES 256 to safeguard your photos, videos, and other files from getting into the hands of invaders or hackers. 1. The music playlist doesn’t appear after sync. 2. Certain songs are duplicated in iTunes. 3. Few songs might be grayed out after the sync. 4. Sometimes, even the iTunes library disappears. 1. All the photos are not synced to the iPhone using iTunes. 2. HEIC photos are not synced. 3. Certain movies cannot be copied to iPhone/iPad with iTunes. 4. MP4 videos cannot be added to the iTunes library. 1. Sometimes, you might have come across the situation where the iPhone won’t connect to iTunes. 2. You may also get iTunes Error 54, ‘iPhone won’t sync with iTunes’. 3.	iTunes may crash while syncing apps. 4.	iTunes Wifi sync may not work. All these errors and you may not be able to sync your device data with Mac. But it is possible to overcome all these errors with MacX Media Trans. MacX Media Trans – Best iTunes Alternative, Know Why? Using iTunes to sync iPhone actually means to refresh data with what iTunes has. It determines what will be left in your iPhone after syncing. But MacX Media Trans offers maximum flexibility and 2-way solution to help you freely copy data from iPhone to Mac and vice versa. You don’t have to keep exactly 1:1 copy on both your iPhone and computer. Unlike iTunes, it is very intuitive and easy-to-use. It can sync your whole or selected data in bulk which includes photos, videos, music, TV shows, podcast, ringtones, eBooks, audiobooks, etc. between iPhone XS/ XS Max/ XR/ X/ 8/ 7/ 6s/ 6/ Plus and Mac OS without the deletion of existing data. The software provides full control to flexibility back up, transfer, delete, restore, and manage iPhone library within a few clicks. Also, it offers 5 times faster speed than any other iPhone sync software. This is due to the enhanced GPU hardware acceleration. 1. The software syncs music in bulk as well as selectively with no data loss or duplicity. 2. It is more powerful as you can easily add, delete, edit music, and playlist as per your convenience and requirements. 3. It even allows the transfer of music that is not purchased from iPhones to computers. 4. It creates iPhone ringtones and auto-converts music to AAC to MP3. 1. MacX Trans Media offers the fastest transfer speed. It takes as little as 8 seconds to transfer 100 4k photos. 2. You can delete any photo from photo library or iPhone camera roll. 3. It allows to backup 4k, live photos to Mac and frees up space. 4. The software auto converts HEIC to JPG. 5. It auto converts videos to MP4. 6. The software compresses video size to 50% with no loss in media quality. 1. The software turns the iPhone as a USB to save Excel, Word, PDF, apps, iBooks, dmg, etc. 2. It encrypts the photos and videos that are transferred from iPhone to Mac or those that have been locally saved on Mac. 3. MacX Media Trans offers 2-way sync that requires no iTunes, no iCloud, and no WiFi. 4. It quickly connects to the iPhone. 5. It has a clean interface and is stable and easy to use. Why Choose MacX Media Trans as iTunes Alternative? 1. Sync file data from computer to iDevice and vice versa. 2. Transferring of files (music, ringtones, iBooks, audiobooks, TV show, podcasts, iTunes purchases, photos, videos, movies, etc.) from iDevice to Mac. 3. Syncing non-Apple music and video to iDevices. 4. Auto conversion of non-Apple video/audio formats to iDevice supported formats during the synchronization. 5. Proper reduction of big-sized files to smaller ones for iPhone saving space. 6. Auto conversion of protected MV4 to MP4 and M4P to MP3. Except for the first feature, iTunes doesn’t offer any features while MacX Media Trans offers all these features and make it a viable choice for the iPhone users to sync and manage iPhone files. Thus, it is very clear and obvious that MacX Media Trans is the best iTunes alternative for Mac. 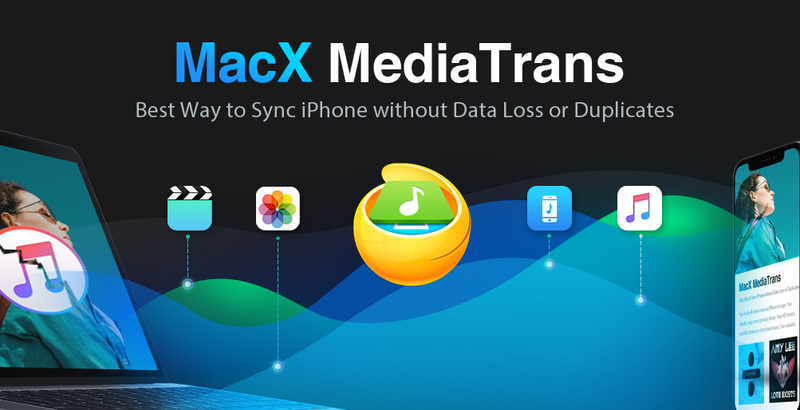 Download MacX Media Trans to sync iPhone files, free from iTunes sync errors. Participate in the giveaway; 3 lucky participants stand a chance to win Apple’s Airpods ($159 USD value). You may also be lucky to win a MacX MediaTrans License Code as a bonus prize ($59.95 USD value). Hurry! The sweepstakes ends on April 10, 2019. Even if your name doesn’t pop up in the winners, the software is worth a download as it allows excellent transfer of iPhone data to Mac and unlike iTunes, you can easily Sync music to iPhone.